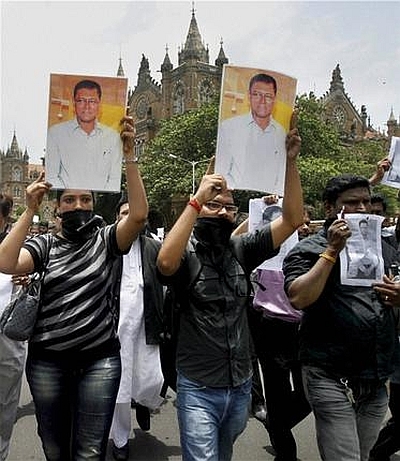 A special Maharashtra Control of Organised Crime Act court in Mumbai on Monday framed charges against 10 accused, including arrested scribe Jigna Vora, in the journalist J Dey murder case of 2011. "The court has framed charges against Vora and nine others under sections of MCOCA, Indian Penal Code, besides other acts. All the accused have pleaded innocence," said a crime branch official. Special Judge A L Pansare read out the charges to all accused after which they all pleaded not guilty. The court has charged the accused with being part of the underworld gang run by fugitive gangster Chhota Rajan, besides hatching a conspiracy and killing Dey. Dey, a senior journalist with Mid-Day, was shot dead in suburban Powai on June 11, 2011 by assailants who followed him on motorcycles. Vora is accused of passing on key information like the number plate of the slain journalist's motorcycle and his address to the fugitive don. The police had arrested her on November 2011 and she was granted bail in July 2012. Also, the police, in December 2011, had filed a charge sheet against arrested accused namely Satiah Kaliya, Abhijeet Shinde, Arun Dake, Sachin Gaikwad, Anil Waghmode, Nilesh Shendge, Mangesh Agawane, Vinod Asrani, Paulson Joseph and Deepak Sisodia. Later, a separate charge sheet was filed against Vora. According to the police, Chhota Rajan, who was upset with two articles written by Dey, which purportedly portrayed him in bad light, had ordered his killing. As per the 3,055-page charge sheet, Vora (who is now out on bail) allegedly instigated the underworld don to execute Dey owing to professional rivalry. One of the accused Vinod Asrani died recently and the case against him has abated, while Rajan and Narayan Bisht -- one of the conspirators -- are wanted in the case.